No Paper Or Pencils Required Here! Fine motor skills, other than spinning small items like a dime, have been a bit of a challenge for Andrew. 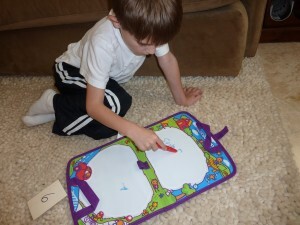 I wrote about some handwriting helpers (markers, crayons and pencil grips) I found that help with finger positioning and I would also like to share some fun toys/tools he’s gotten that I’ve incorporated in My Obstacle Courses to help engage him in the writing/drawing process. See Mom? I DO Need Help! It never failed, as soon as I would get out paper and writing tools, he would hold them for a minute and then say in his very weepy voice, “Help me Momma! I need help.” I would encourage him to try a little by himself but that would result in him scribbling something really big over the whole paper while looking at me, not the paper :), as if to say “See? I DO need help!” I tried hand over hand with him, which was a bit more successful but getting him to try it on his own was quite a challenge. 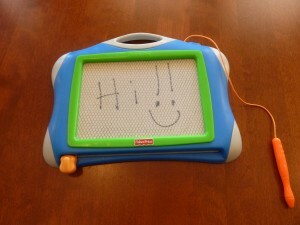 One day I found his Doodle Pro in his room with some of his drawing on it. I brought it down and used it the next time we did My Obstacle Course, taking turns to make shapes and different kinds of lines (a post coming soon on how to turn this into more of a game!). 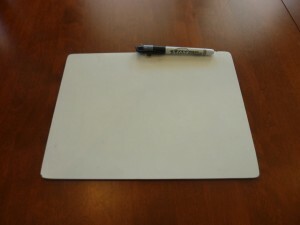 White/dry erase boards got thumbs up as well. What Is It About Paper And Pencil? When I notice things like this, the teacher in me starts to analyze a bit. What is it about these toys/tools that make this activity more tolerable to him? What are his avoidance behaviors telling me when I bring out paper and pencil? 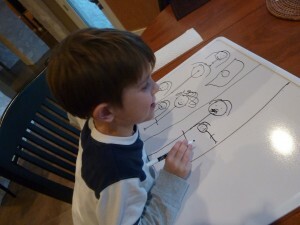 I thought about the difference between them and I think the main reason is that since the Doodle Pro (or Magna Doodle), Aqua Doodle and white boards are not “permanent” like pencil/paper (at least in his eyes) it was not as daunting. It was no big deal to make some markings on them because they were easy to get rid of. They were not permanent and if it didn’t turn out the way he wanted, he wouldn’t have to look at them for more than a few seconds. I think that if kids know that what they are putting down on paper is not the way they want it to look, they get frustrated and don’t really want to try anymore (kind of like me and baking!). For Andrew, using tools that make the writing easy to “wipe away” helped him slowly build up his confidence. By removing some of the pressure, we could focus on the basics of the skill. Now he loves his big white board where he can draw people and fans (his two obsessions right now) because he has an opportunity to practice while being able to easily rub unwanted lines or marks away. If you have a child who is reluctant to write or draw, I encourage you to think beyond pencil and paper. A lot of what I’ve learned from my son has come from trial and error so don’t give up introducing skills or concepts in different ways because chances are eventually something is going to click!